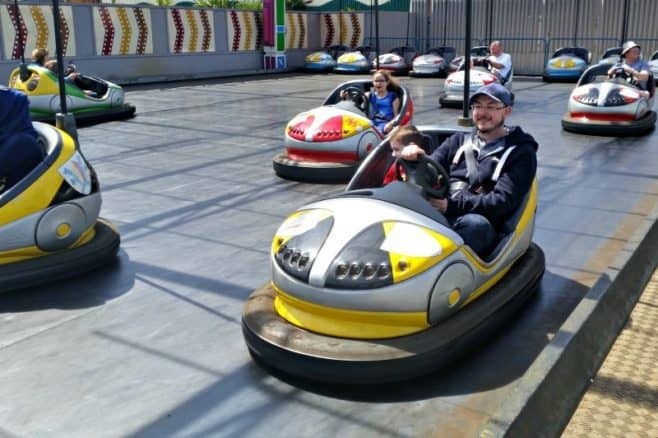 One of the things we missed out upon during our first trip to Butlins three years ago was Sir Billy Butlins Fairground. The British weather wasn’t playing ball that week and whilst we made use of the indoor soft play area and indoor rides we didn’t have the opportunity to ride on the outside rides within the fairground. On our recent visit, however, we made up for it. Over the course of our stay, we must have visited the fairground whenever we had any free time between shows and meals. Roo has always been a thrill seeker, our fearless child with Tigger being the fearful one, however, Tigger has recently come out of his shell and is also loving the fast and spinning rides. 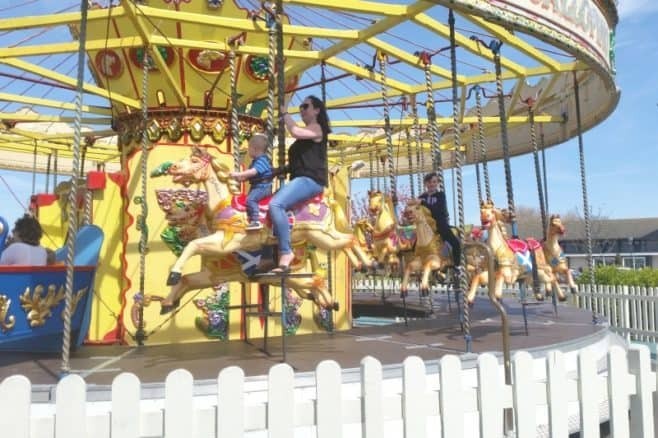 The Fairground at Butlins, Bognor Regis opened in 2012 and has a mixture of rides, traditional fairground stalls, and landscaping to make you want to stay there all day and enjoy the sunshine whilst the children are hopping from one ride to the next. This was the first ride that Roo wanted to go on, with Tigger looking unsure he decided to watch her on it for the first go to see whether or not he’d like to try it. As soon as Roo came off Tigger wanted a go, so Mr. Boo headed back to join the queue for another go (sorry Mr Boo!). For me, the Helter Skelter really adds that traditional fairground feel . Roo loves the Helter Skelter and had many a go on it, I even managed to capture these fab shots of her coming down it. I have to hold my hands up and say that I am usually the bag lady whenever we visit fairgrounds. I’m not one for fast rides, especially ones that spin round and round. Feeling brave and wanting to live outside my comfort zone I decided to bite the bullet and head on the Trabant. Now Mr. Boo who had been on this ride earlier with Tigger assured me that I’d be OK.
Hopping on board with Tigger by my side I knew within seconds on the ride starting that I was way outside my comfort zone. With my eyes tightly closed and my grip on the bar in front of me even tighter. I had one of those moments where Tigger and I switched places and he became the parent and I the child. I was giving myself a pep talk, saying ‘just breathe, everything is OK’, with Tigger saying ‘I’m OK Mummy’. With me then replying ‘I’m not talking to you, I’m talking to myself’. Needless to say, I didn’t venture back on there for a second go. There is something so magical about Carousels. I think it must from watching Mary Poppins as a child, there is always a part of you hoping that the horses are going to break free and take you on a magical adventure. Usually, Tigger always misses out on the Dodgems at fairgrounds as he isn’t tall enough to meet the minimum height requirements. 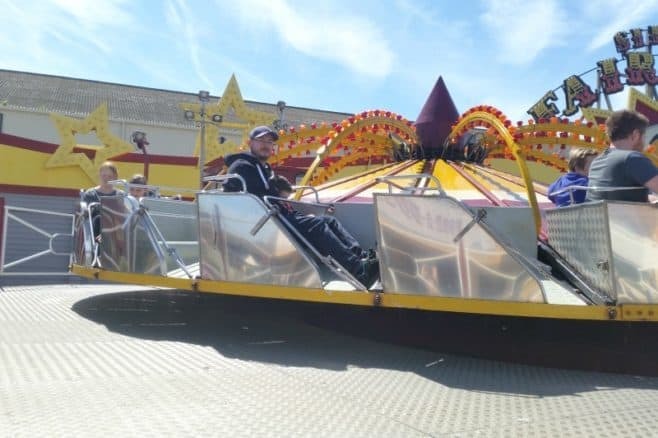 So you can imagine the smile on his face when he realised that he could go on the Dodgems at the Sir Billy Butlins Fairground sitting alongside Daddy. this would be a real highlight of a Butlins trip for me too. I do think you are brave testing out a dizzy naking ride, I would have had to back out of that one but the Helter-Skelter and Dodgems would be a must. My thrill seeking kids would have loved all the rides. I’m glad you managed to test them all to the full on this visit and you have captured some great photos to remember the visit. 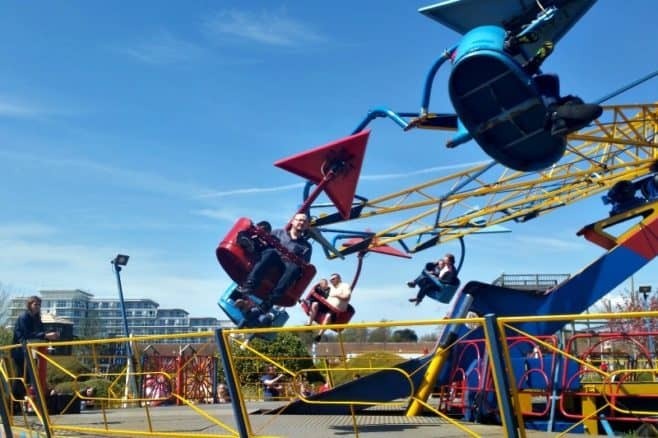 This looks like great fun, you cannot beat a fun fair!